Sanjuana Martínez has a most distinguished career as a journalist and writer (please ‘Google’ her for the data) and has received several prestigious prizes among which are the National Prize for Journalism in 2006 and the Ortega y Gasset Prize in 2008. Sanjuana in her person and work embodies the highest values of PEN International and of the principles of freedom of expression and the critical importance of investigative journalism for the health of civil societies. 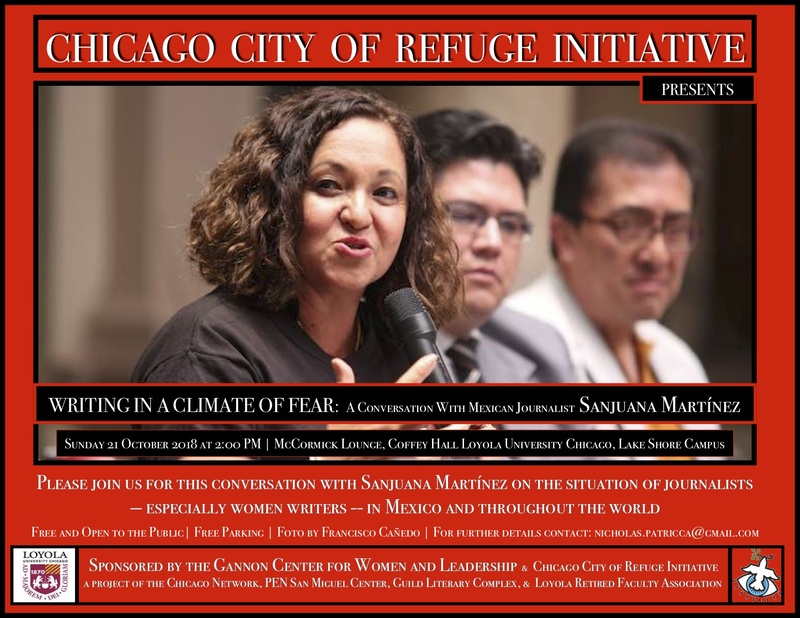 The Chicago City of Refuge Initiative is a project of Chicago Network (DBA: Chicago Network for Justice and Peace), the Ann Ida Gannon Center for Women and Leadership at Loyola University Chicago, the Guild Literary Complex, San Miguel PEN. For additional information, please contact: Nick Patricca at nicholas.patricca@gmail.com. A Project of the Chicago Network for Justice and Peace (www.chicagonetworkjp.org) in collaboration with the Gannon Center for Women and Leadership at Loyola University Chicago and the Guild Literary Complex. The Chicago City of Refuge Initiative seeks to provide a home for writers at risk of being persecuted, tortured, imprisoned, or murdered for the non-violent expressions of their opinions and creativity in their native countries, regions or cultures. We offer temporary sanctuary to writers who give voice to matters of vital concern to our communities as well as to the global human community. We seek to place writers at risk in working situations which enable them to pursue their art and to make their appropriate contributions to the artistic life of Chicago and its various communities. In affiliation with the International Cities of Refuge Network (ICORN), we participate in the mission and activities of an international organization which is recognized by and collaborates with the United Nations and the European Union’s Parliament and Council on projects of artistic freedom. We have chosen to focus our CHICAGO CITY OF REFUGE Initiative on writers in order to focus attention on the great tradition of writing that comes from Chicago and because writers are among the first to suffer from laws and actions against freedom of expression as they give voice to those who cannot speak for themselves and as they endeavor to effect constructive change in society. We co-ordinate our work with PEN International, the largest world-wide organization of writers, which advocates for writers at risk and in prison, for freedom of expression, for linguistic and cultural rights, and for the freedom to create. Our commitment to the values of hospitality, solidarity, and freedom of expression springs from the extraordinary vitality and rich creativity of our diverse immigrant populations which has nurtured the strong traditions of our artists in shaping their material, moral, and spiritual contributions to the City of Chicago, to the USA, to the global community. PROGRAMS: Readings from the works of our writers; Panels on the issues of migration, artists crossing borders, and refugee/asylum status; Dramatic works based on narratives of migrants and artists in jeopardy; Co-ordination with other programs for writers in USA and world-wide, such as the PEN ‘Make Space’ project. CONTACT: nicholas.patricca@gmail.com for additional information and for making your own contributions to this INITIATIVE. Thank you for your attention, Nick Patricca, Co-ordinator, Chicago City of Refuge, President, Chicago Network.